This Database is updated every 120 Days. 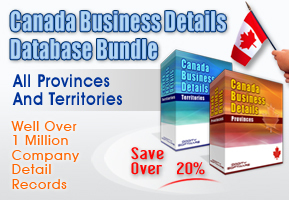 Master License holders can purchse updates for this database for $20.00. 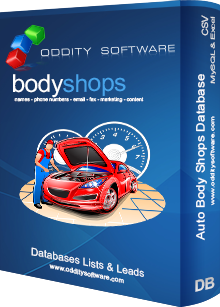 This Auto Body Shops Database contains information for businesses in the Auto Body Shop category. Associated subcategories including Auto Repair Shops, Auto Service Centers, Tire Centers, Battery Installation Services and State Inspection Centers. Developing your own comprehensive network of contacts and client leads is essential to both personal and business success, but it can be difficult to manage the necessary growth while continuing to build on your existing list of clients. Using a downloadable database, however, makes it much easier to expand your client base and handle future growth needs. Whether you are looking for a new source of auto body supplies or marketing a product to owners of auto repair facilities, the Auto Body Shops Database will come in handy and help you with your search. With some 69,000+ records from across the United States, the Auto Body Shops Database will instantly enlarge your list of contacts and client leads. More importantly, the database is orderly and instantly available to get you networking in a flash. Just download the database to your computer and start calling on auto body shops in your hometown, thousands of miles away and everywhere in between. With so many contacts at your fingertips, you are sure to find the auto body shop that meets your needs. Anyone interested in the auto body and auto repair business should be using the Auto Body Shops Database. With this database you can instantly start to connect with potential clients from around town and around the country. If you have a product that would appeal to owners of auto body shops, you can use the database to market that product and meet decision makers in the industry. Trying to compile this many contacts on your own would be a waste of your valuable time. By using the Auto Body Shops Database, you can get the leads you need and focus your marketing efforts where they will do the most good. 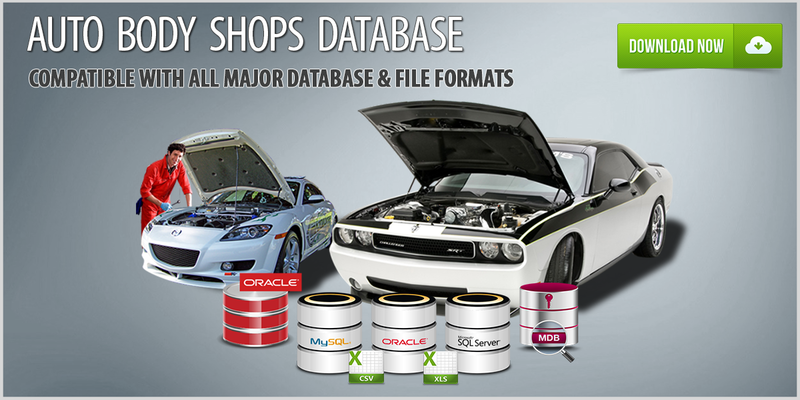 The Auto Body Shops Database is an ideal resource for web developers and web designers. The fact that this database contains so many records people search for every day means that adding it to your niche directory or search engine could boost your traffic substantially. Give your web visitors what they need by including the Auto Body Shops Database on your website. Whether you are looking for local auto body shops or marketing a product to auto body shop owners, the Auto Body Shops Database is a valuable resource you will use again and again. It would be very hard to find so many up-to-date contacts anywhere else, but we have collected the information you need to build your business and market your products and services. Building your network is essential to maintaining and growing your business, and the Auto Body Shops Database is one of the best tools at your disposal.